The Bacalhôa Greco di Tufo Setúbal Branco is a white wine made by Bacalhoa from Setubal that contains greco bianco grapes. 4 of 5 points is the average score of this white according to Uvinum users. What's the evaluation of the Bacalhôa Greco di Tufo Setúbal Branco? 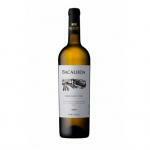 What are the opinions of other vintages or volumes of Bacalhôa Greco di Tufo Setúbal Branco?